Information and knowledge about the best tablet for kids, so parents can choose the tablet in more proportionate and effective way to grow their children's intelligence. "What is the best tablet for kids?" This is not a question of good parents. More precisely the question of market research that aims to evaluate the design of new products. As the presence of a PC Desktop or laptop, the tablet is now starting to get into the household environment. Compared to the PC Desktop or laptop, tablet more familiar and attract all family members, including children. So at some point you would have to buy a tablet for your child. Then if you ask "What is the best tablet for kids?" Once again, this is the wrong question. The right question is "At what age is it OK to buy tablets for your kids?" Of course, you need to know what the benefits of the tablet for children early age. How negative impacts that may arise? What is the exact screen size and what features are needed the child? At present, tablet does not have market segmentation. All the tablets are designed to meet the needs of adults. When the market is already full, the producer saw market gaps among teenagers and children. Now the tablet competition is getting hot, so many manufacturers entering the market gaps. In the near future, the tablet market will be more because of the age-adjusted user. Start pre-school children, children of primary school age, children school age up to children before adolescence. Market competition will help parents not difficult to choose the tablet according to the age of their child. So when you ask "What is the best tablet for kids?" Now virtually all brands of tablets sold to children has almost the same features. Manufacturers compete to make the best tablet for the kids to be able to dominate this market. Compared with two years ago, the parents it is easier to choose a tablet for their children. But the most essential questions must still be answered: "At what age is it OK to buy tablets for your kids?" We might be able to refer to the opinion of Dr.. Ari Brown, a spokesman for the American Academy of Pediatrics is quoted from an interview with HuffPost. "As a parent, you have to look at your child's level of maturity and their level of development," he said. According to him, this was an expensive purchase because you have to decide: Is your child really going to get the value of this sort of thing. Dangers of the tablet does not lie in the potential for the tablet can access the Internet freely, because of the danger of such existing use on a smartphone that child, or on a PC at home. But what a tablet can provide real benefits for your child. 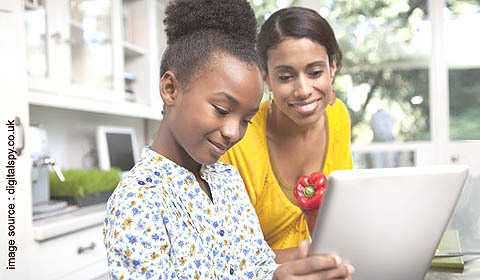 Is having a personal tablet is not a waste of time your child? Is the tablet does not reduce the child's social interactions?, Or confiscate children's play activities that could affect physical development? In general, you should know the impact of the interaction between the technology to the level of physical development of children. With a little knowledge, you can avoid excessive advertising. Intense competition often forces the sellers to ignore the interests of consumers. Children under 2 years of age. Children at this age like the sound and light, they will likely be interested in a tablet PC that is used nearby. But do not be left too long in the near tablet PC or gadgets that emit radiation. Children under age two are still in the early growth stages and do not yet have the physical strength as adults to receive the radiation. Limit their time playing with electronic products that emit radiation, because it can harm brain development and physical. Should children be given at the age of traditional toys are safe and train their muscles. Children in pre-school age. At this age have started a clever use of his fingers, so very interested in the tablet PC touchscreen. The tablet can be a device to support learning activities. But set their time to use the tablet, so that they can still play to develop physical and social interaction with peers. Perhaps you feel safe if your child is just being in the room using the tablet, but the fact you let the child grow up with a lack of social interaction. As a result, children may experience difficulty in relationships, later as an adult. For children at this age, do not buy tablets sold at expensive prices. Children are still learning to use a tablet, a great curiosity will encourage them to make an assortment of the tablet. Maybe once tablets become corrupted and you buy another new tablet. At this age, children will change the tablet a few times. Could be due to damage, because he wanted to own and use a last version tablet, or feel that the tablet specifications are not able to support their work. Or just want to have the latest model tablet. Login Age Youth. Especially children over 13 years are adept at operating the tablet PC and a Laptop or Desktop PC. They also have advanced install various programs, even at this age many children own and manage their own blogs. Nevertheless, children still need to be briefed to select useful content, do a post that does not violate the law, and the dividing of time using a tablet to play and to learn. In accordance with their age, many children who tend to use a tablet to make online games. Teens ages. Children at this age are difficult to "controlled" by their parents. Even the ability to operate the tablet PC, the parents have to learn from them. Nevertheless, they are your children. Parents are more clever to tell what is good and bad. If from the beginning, parents are providing leadership and being democratic, always giving guidance with logical reasons, then your children will continue to obey and respect you, although it tends to be in a position as a friend. Indeed, you will be an effective parent if it could be a friend to them. now-a-days tablet for kids is very important. Because in this busy schedule parents have no time for their children. We can engage them by giving this tablet. This generation’s children are very smart and quick learner it’s very important to provide them such type of gadgets. Keep posting like this.